If your South Central Michigan home’s windows are getting tired and old, it might be time to replace them. Replacement windows have made huge improvements over the years and today's window products are engineered to be energy efficient, nearly maintenance free and protect your flooring, drapes and furniture from harmful UV rays. If your South Central Michigan home’s windows are getting tired and old, it might be time to replace them. Replacement windows have made huge improvements over the years and today’s window products are engineered to be energy efficient, nearly maintenance free and protect your flooring, drapes and furniture from harmful UV rays. These features can be found in the many choices of shapes, style, and colors that match your home’s personality and budget. Here are four big benefits of having Lakeview Windows & Siding install new replacement windows in your home and why it’s worth the investment. Lets face it, we all hate high monthly utility bills. And the fact of the matter is, up to 70% of all heating and cooling energy is lost through your old windows. You can save up to 25% on your energy consumption by saying goodbye to those old drafty windows, crooked frames, cracked seals and single pane glass and replacing them with new Energy Star rated windows with hi-tech lowE coatings and argon gas from Lakeview. In some of our service areas you can even qualify for direct rebates through your energy provider. Older windows tend to require a lot of maintenance and quite often it is maintenance we ignore or defer until real damage to your home has been done. I can’t count the times we have discovered serious problems with mold and to structural framing caused by water entering the wall cavity via rotted sills. Both of these potential problems can lead to real concerns about your family’s health and safety. Even if you haven’t let your windows get that bad, who wants to spend the precious time scrapping and painting? Our system of custom bending and capping your old exterior trim will leave the exterior of your windows beautiful and virtually maintenance free. Let’s not forget how fun it is to clean the outside of your old windows every spring, and if your home is a 2 story, well forget about it. By installing new replacement windows, you can avoid a lot of wasted time and money spent on maintenance and those beautiful new double hung windows will now just drop in for easy cleaning. Durable materials like virgin vinyl frames and sashes with welded corners, advanced weather stripping, and hi-tech insulated glass systems will ensure the strength and durability to keep your windows functioning and looking good for a long time to come. Not only will you recognize the value you just added to your home immediately, but that value can transfer to real dollars and a faster sale when you put it on the market. According to Angie’s list you can expect at least a 70% return on your replacement window investment when it comes time to sell your home. A home with low maintenance, high efficiency, beautiful windows that saves prospective buyers money on their heat bills will surely add to the marketability of your home. You’ll be able to sleep soundly knowing you have new windows with secure latches and double-strength glass that will open easily when needed. New windows can aid in easing fears of break-ins and intruders. Our window frames are extremely strong and most come equipped with double locks. A standard interlock system makes it extremely difficult to open a locked window from the outside. High impact resistance double strength glass is also standard as well as night ventilation latches that prevent the lower sash on all double hung windows from fully opening while still allowing the breeze to flow through while you are away or sleeping. 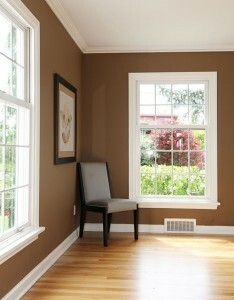 Old windows that have been painted shut are more than an inconvenience; they are a safety risk. Ah yes, the main reason most of us make improvements to our homes; we simply want to be more comfortable in them while protecting our investment. When cold winter air enters your home through your windows either because they are worn out or were poorly installed, the heavier cold air moves down the wall and across the floor pushing the nice warm air up and across the ceiling until it finds a way to escape. This makes room for more cold air to flow across your feet and legs carrying with it not only your hard earned cash but also your comfort. New replacement windows purchased and installed by Lakeview Windows & Siding guarantees you will receive only high quality warranted products that have been properly installed at prices that provide real value and added comfort in your home as well as the comfort of knowing you trusted the right company with your home improvement project. Call Lakeview Windows & Siding today at (517) 924-1299 or (269) 963-1200 to schedule a free no-pressure consultation for new replacement windows for your home.